On the feasts of the Sacred and Immaculate Hearts we made paper hearts. These are made with nothing but paper, markers and glue. They are simplistic but very pretty. Cut the sheet of red paper in half and fold each half long ways. Cut out a half heart so that when you open it to will be a whole heart. Cut out a larger yellow "flame" and a smaller orange "flame." Cut out two strips of brown for the cross. Cut our short pointy brown strips for the crown of thorns. Glue the orange flame on top of the yellow flame and the cross on top of the orange flame. Glue that onto the top of the underside of the heart as pictured. Now make "X" shapes where the crown of thorns should be, all the way across. Now use a brown (or black) marker to make a curved line for the spear wound. Add red around it and a blood drop. That's it for the Sacred Heart of Jesus! Now for the Immaculate Heart of Mary! Do the same as above to make the heart and flames. Glue the flames to the top-underside of the heart. Cut out simple pink flower shapes and add those across the center of the heart. They don't need to be perfect. When you place them beside each other you won't see the mistakes on the flower shapes. Use a yellow marker to create the flower's center. We added small green leaf shapes around the flower, too. Cut out a cross shape and round the ends on the handle parts. Use a brown marker to create the look of a handle. Use a red marker to make a cuved line for the cut onto the heart and use scissors to put a slit in the red cut. Slip the sword through the cut and glue it on the under side. That's it!! So paper simple! Sacred Heart of Jesus and Immaculate Heart of Mary, pray for us! So cute Jennifer! 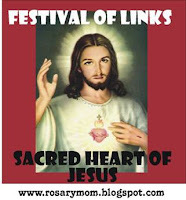 You should come and link up with us for the Feast of the Sacred Heart and Immaculate Heart of Mary! Thanks Noreen! I'll pop over and add the post to your link-up! God Bless! That is really cute! I bet a flower paper punch would also work great on the Immaculate Heart! A flower punch!!! Cool! ;-) I'm gadget deprived at my house! We couldn't fit those need little gizmos into our budget! But that sure would be nice a easy! Thanks so much, Alicia! God Bless! If you can get a good deal from Michael's or Archivers, then the punches are quite reasonable. I'm on Archiver's email list and I get coupons sent to me for 40% off about once or twice a month. I will buy a punch if I have that coupon! Thanks Noreen, we don't have a Michael's or Archivers in our area. We have an AC Moore. I just don't often get out these days. I guess I could now since I'm feeling better, but I'm not in the habit! I'm trying to retrain my brain to realize I no longer have my old "handicap"!! For the past 4 years I've been unable to get out, now I can and I forget that I can!! Oh, it's a joy...a joy I have to remember! ;-) We all take so much for granted! Another great project. Thank you for linking to the Our Favorite Things Link Party. I really appreciate your support. Thanks Karri!! Great Party!! ;-) God Bless!! My kidos just made these today (::Nodding head in shame::: I know I'm a tad bit late!!) Thanks for sharing this! LOL! Oh, Holly, I don't call that late! I'd say you're doing fine! ;-) Hope the kids had fun! God bless! Jennifer, I have been wondering how to make the crown of thorns on our card stock heart, so thank you so much for this idea! I will link my post to the Crafolic Moments link up after we make it. Hi Elisa! Glad to help! I'd be very happy to have you post to the Crafolic Moments link-up! Thank you so much and God bless! These are so pretty, Jennifer! I was thinking about making them out of felt pieces and letting my toddler put them together on a felt board. Wonder how it would turn out? Keep you posted if I end up giving it a whirl. Love your new blog background and header too:) God Bless! Thank you, Tiffany! I think your felt board idea is a very nice idea!! You might want to make the crown of thorns one piece so they don't get lost too easy. But you're a crafty gal I'm sure you can make the idea work!! ;-) Thank you again and God bless! !